Catalysis Conference Calendar -CCC- Established in 2008 - One of the most complete of its kind. XVIth Netherlands Catalysis and Chemistry Conference, Noordwijkerhout/NL, 4-6 March, 2019. 21th European Symposium on Organic Chemistry, Vienna, Austria, 14-18 July, 2019. 47th World Chemistry Congress, Paris, France, 5-12 July 2019. XIXth Netherlands´ Catalysis and Chemistry Conference, Noordwijkerhout/NL, 5-7th March, 2018. 51 Jahrestreffen Deutscher Katalytiker, Weimar, Germany, 14-16th March 2018. 20th International Conference on Catalysis, Dubai/UAE, 21-22 June 2018. 21th International Symposium on Homogeneous Catalysis (ISHC-21), Amsterdam, The Netherlands, July 8th-13th, 2018. 28th International Conference on Organometallic Chemistry 2018, Florence, Italy, 15-20 July 2018. 43nd International Conference on Coordination Chemistry ICCC43, Sendai, Japan, 30 July - 4 August 2018. 7th EuCheMS Chemistry Congress, Liverpool, UK, August 26-30 2018. 8th International IUPAC Conference on Green Chemistry, Bangkok, Thailand, 9-14 September 2018. 27th Conference on Molten Salts and Ionic Liquids, Lisbon, Portugal, 7-12 October 2018. XVIth Netherlands Catalysis and Chemistry Conference, Noordwijkerhout/NL, 6-8 March, 2017. ABSTRACT SUBMISSION: see homepage, t.b.a. 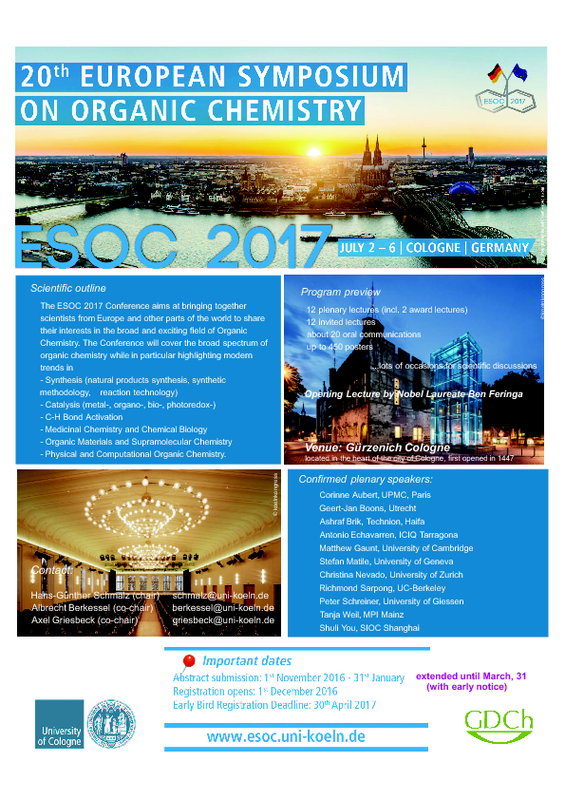 20th European Symposium on Organic Chemistry, Cologne, Germany, 2-6 July, 2017. Ibero-Latin-American Symposium on Coordination and Organometallic Chemistry, Puerto Iguazú, Misiones, Argentina, August 6-11, 2017. 8th World Congress on Oxidation Catalysis, Krakow, Poland, 3-8 September 2017. 17th Brazilian Meeting on Organic Synthesis, city (t.b.a. ), Brazil, November 2017. 46th World Chemistry Congress, Sao Paulo, Brazil, 9-14 July 2017. XVth Netherlands´ Catalysis and Chemistry Conference, Noordwijkerhout/NL, 7-9th March, 2016. Abstract Submission ends: March 2016 ? 20th International Symposium on Homogeneous Catalysis (ISHC-20), Kyoto, Japan, July 10th-15th, 2016. 6th EuCheMS Chemistry Congress, Sevilla, Spain, Sep. 11-15 2016. 26th Conference on Molten Salts and Ionic Liquids, Vienna, Austria, 3-8 July 2016. 6th International IUPAC Conference on Green Chemistry, Venice, Italy, 4-8 September 2016. 27th International Conference on Organometallic Chemistry 2016, Melbourne, Australia, 17-22 July 2016. 42nd International Conference on Coordination Chemistry ICCC42, Brest, France, 3-8th July 2016. 16th International Congress on Catalysis, Beijing, China, 3-8th July 2016. 18th International Conference on Catalysis, Dubai/UAE, 1-2 June 2016. Chemistry, city (t.b.a. ), Brazil, October 2015. XVth Netherlands´ Catalysis and Chemistry Conference, Noordwijkerhout/NL, 10-12th March, 2014. 15th International Conference on Theoretical Aspects of Catalysis (ICTAC-15), London, Uk, 30/07-04/07 2014. Deadline of abstract submission: Monday 10th February 2014. 19th International Symposium on Homogeneous Catalysis (ISHC-19), Ottawa, Canada, July 6th-11th, 2014. 5th EuCheMS Chemistry Congress, Instanbul, Turkey, 31/08-04/09 2014. 25th Conference on Molten Salts and Ionic Liquids, Tallinn, Estonia, 6-11 July 2014. 5th International IUPAC Conference on Green Chemistry, Durban (South Africa), 17-21 August 2014. 26th International Conference on Organometallic Chemistry 2014, Sapporo, Japan, 13-18 July 2014. 41st International Conference on Coordination Chemistry ICCC41, Singapore, Singapore, 21-25th July 2014. Submission deadline: January 31, 2014. 7th International Congress on Biocatalysis 2014, Hamburg/Germany, 31/08-04/09/2014. XIVth Netherlands Catalysis and Chemistry Conference, Noordwijkerhout/NL, 11-13 March, 2013. 18th European Symposium on Organic Chemistry, Marseille, France, 7-12 July, 2013. Ibero-Latin-American Symposium on Coordination and Organometallic Chemistry, Huatulco, Mexico, 13-17 October 2013. 15th Brazilian Meeting on Organic Synthesis, Campos do Jordão, Brazil, 10-13 November 2013. XIIIth Netherlands Catalysis and Chemistry Conference, Noordwijkerhout/NL, 5-7 March, 2012. 18th International Symposium on Homogeneous Catalysis (ISHC-18), Toulouse, France, July 9th-13th, 2012. 25th International Conference on Organometallic Chemistry 2012, Lisbon, Portugal, 2-7 September 2012. ADHOC 2012 - Symposium of the Activation of Dioxygen and Homogeneous Catalytic Oxidation, Jerusalem, Israel, September 2-7, 2012. 40th International Conference on Coordination Chemistry ICCC40, Valencia, Spain, 9-13th September 2012. XIIth Netherlands Catalysis and Chemistry Conference, Noordwijkerhout/NL, 28th Feb - 2 March, 2011. 17th European Symposium on Organic Chemistry, Hersonissos, in Crete, Greece, 10th-15th July, 2011. XIth Netherlands Catalysis and Chemistry Conference, Noordwijkerhout/NL, March 1 - 3, 2010. 43. Jahrestreffen Deutscher Katalytiker, Weimar/Germany, 10. - 12. March 2010. 17th International Symposium on Homogeneous Catalysis (ISHC-17), Pozna?, Poland, July 4th-9th, 2010. ISHC Post Symposium "Metal Nanoparticles in Catalysis", Wroc?aw, Poland, 9th-11th July 2010. 24th International Conference on Organometallic Chemistry 2008, Taipei, Taiwan, 18-23 July 2010. 39th International Conference on Coordination Chemistry ICCC39, Adelaide, Australia, 25-30th July 2010. XXII Congreso Iberoamericano de Catálisis, Viña del Mar, Chile, 5-10th September, 2010. 9th Congress on Catalysis Applied on Fine Chemicals (CAFC9), Zaragoza, Spain, September 13th-16th, 2010. XXV INTERNATIONAL CONFERENCE ON ORGANOMETALLIC CHEMISTRY, Lisbon, Portugal, 2nd -8th September 2012.